Sadeghi, Fatemeh. 2018. Sin of the woman. 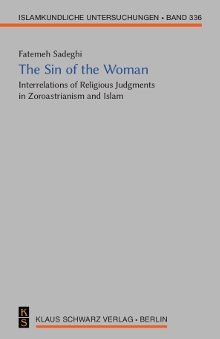 Interrelations of religious judgments in Zoroastrianism and Islam (Islamkundliche Untersuchungen 336). Berlin: Klaus Schwarz Verlag. Histo­rical evidence is indi­ca­tive of sexual permis­sive­ness, mostly in the form of ›mut’a‹, among the non-Muslim Arabs as well as early belie­vers, who strongly insisted on having sexual inter­course with diffe­rent types of women, parti­cu­larly war captives (mainly from the ›ridda‹ battles), despite the strong Qur’anic prohi­bi­tions and the Prophet’s disap­pro­ving commands.